The year 2013 has produced much action and intrigue in the sport of Boxing. One could well argue that the breakout star of 2013 has been unified WBA/IBO Middleweight world champion Gennady Golovkin. Golovkin’s crowd pleasing seek and destroy style has certainly turned heads and has caused people to take notice of a man who might be the fighter who could take control of the Middleweight division in the not too distant future. Golovkin’s ability to score knockouts has been a focal point that many will point to when there is an argument made that he is the fighter who will become the central figure of the division. It is certainly hard to make an argument against a fighter who has put together a string of consecutive knockouts like Golovkin has. Golovkin has not been made to go the distance in a fight since 2008 when he scored an eight round unanimous decision over journeyman contender Amar Amari. In the five years since, Golovkin has compiled fourteen consecutive knockouts and eight successful title defenses of his Middleweight championship which he won in 2010. A counter argument that some may make could be that Golovkin has not fought fighters who most would consider household names in twenty-seven professional fights thus far. “I respectfully disagree.” Since earning interim/regular status in the WBA’s Middleweight ratings, a distinction that eventually would be elevated making him a unified world champion, Golovkin has stepped up in the quality of his opposition. One has to look no farther than his last title defense in June of this year when Golovkin scored a brutal third round knockout over top contender Matthew Macklin. Macklin, who has been a top contender for several years had lost only two fights prior to facing Golovkin. A disputed decision loss to former longtime Middleweight champion Felix Sturm and suffering an eleventh round knockout at the hands of Sergio Martinez who many consider the top fighter in the Middleweight division. Prior to his knockout of Macklin, Golovkin scored an equally brutal third round knockout over Nobuhiro Ishida. Ishida, had never previously been stopped in his career. An appropriate question that some might ask is, who in the Middleweight division can extend Golovkin into the deep waters of a fight? When a fighter has scored as many consecutive knockouts as Golovkin, questions regarding that fighter’s stamina may indeed be warranted. Although Golovkin has gone the distance three times in his career, one could wonder whether or not he can be as effective and devastating a puncher the longer a fight goes. Golovkin has only had to go as far as eight rounds in the three times he has gone the distance. It is an interesting question as to whether or not fatigue could play a factor if and when Golovkin is extended beyond eight rounds, or even forced to go a full twelve rounds. One would have to assume that the question of how fatigue might affect Golovkin as a fight goes deeper will be answered in time. Although some have already anointed Golovkin as the heir apparent of the Middleweight division with anticipation of an eventual showdown with Sergio Martinez, Golovkin must first focus on his next title defense. The man who will be challenging who thus far has seemed like an indestructible force, Curtis Stevens. Stevens, comes into this fight with a record of 25-3, with 18 Knockouts. Stevens also comes into this fight having scored knockouts in three of his last four fights including a devastating first round knockout of journeyman contender Saul Roman in his last fight in August of this year. The obvious question that some will ask as this fight approaches is can Stevens neutralize and nullify Golovkin’s come forward pressure style, and whether or not he can avoid his power. It should be noted that Stevens has not lost a fight since 2010. a twelve round unanimous decision to Super-Middleweight contender Jesse Brinkley, who most fans will remember for his time on the “The Contender” reality TV series. Since dropping down in weight from the 168lb. Super-Middleweight division to the 160lb. Middleweight division Stevens has been unbeaten. Stevens has also shown that he can go the distance throughout his career, one might argue based on this that this fight could end up being a test for Golovkin. The key of course will be whether or not Stevens can survive an early storm from the champion if Golovkin can implement his pressure style from the outset. Although Stevens has displayed punching power of his own throughout his career, it may serve him well to look to box Golovkin and look to extend this fight into the middle and late rounds. A fight toe to toe would seem to favor the champion. Although some may indeed be anticipating a shoot out between these two fighters given each of their recent fights, if Stevens can find a way to extend this fight and nullify the pressure style of the champion, one could say that the longer the fight goes, the more it might favor Stevens. Whether or not Stevens can find a way to derail what has thus far has been an indestructible force remains to be seen. 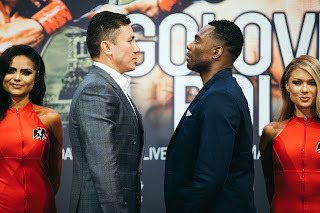 One should also consider as this fight approaches whether or not the increasing interest and marquee value that Gennady Golovkin has enjoyed recently will influence how he fights. Golovkin has used a systematic approach to score many knockouts. Some fighters however, have at times been influenced by wanting to be entertaining and thus continue to grow a following and increase their star value. After so many knockouts, one may be tempted to ask whether Golovkin will be overly aggressive from the outset looking to score his fifteenth consecutive knockout and not worry so much about winning rounds. It will be interesting to see if indeed Golovkin tries to headhunt in this fight how it will affect him if Stevens can extend the fight into the middle and late rounds. Should Gennady Golovkin be successful in his ninth title defense, it could be likely that we might see a unification bout between Golovkin and Sergio Martinez in the next year or so. If however, Golovkin is looking past this fight with an eye toward what some see as an eventual showdown with Martinez, Stevens could surely be the wild card who may disrupt those plans. What will happen? We will have to wait and see.